During the final approach for the short cross country flight, the pilot heard a "thud." During the landing flare the pilot suspected a landing gear issue and landed as gently as possible. However, the right wing settled onto the runway and was substantially damaged. A postaccident examination revealed that the landing gear had not been reinstalled correctly during maintenance performed in 2013. Only one of the 8 fasteners required for installation was recovered and it was sheered. The damage to the wing and landing gear was consistent with the improper installation of the fasteners and was not impact related. It is likely that the fasteners were either not installed or not torqued properly during the previous maintenance. Subsequent annual and 100-hour inspections did not detect this discrepancy. The improper reinstallation of the right main landing gear by maintenance personnel which resulted in the separation of the landing gear and the subsequent abnormal runway contact during the landing. 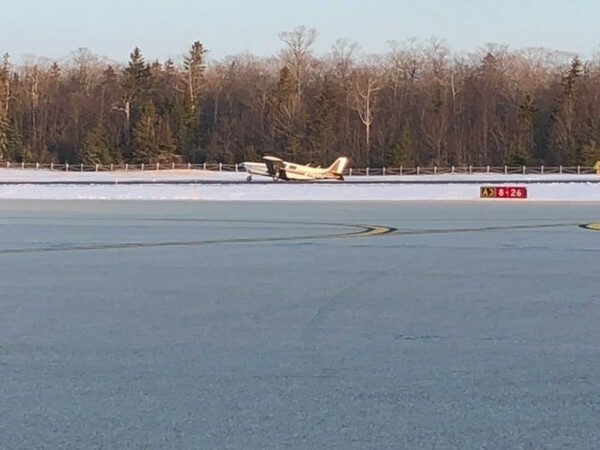 On February 26, 2018, about 0745 eastern standard time, a Piper PA-32-260 Cherokee Six airplane, N7122J, was substantially damaged while landing at the Mackinac Island Airport (KMCD), Mackinac Island, Michigan. The commercial certificated pilot and 4 passengers were not injured. 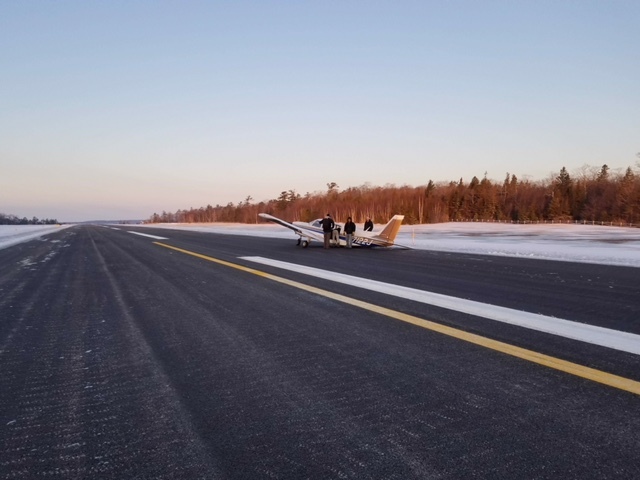 The airplane was owned and operated by Great Lakes Air Inc., under the provisions of Title 14 Code of Federal Regulations Part 135 as a non-scheduled passenger flight. Visual meteorological conditions prevailed and no Federal Aviation Administration (FAA) flight plan was filed for the flight. The flight departed Mackinac County Airport (83D), St Ignace, Michigan, about 0730, and was en route to KMCD. According to written statement submitted by the pilot, the airplane was on final approach when he heard a "thud." During the landing flare, the airplane seemed to settle more than normal. The pilot suspected a landing gear problem or a blown tire and decided to continue with the landing. The pilot landed as "gently" as possible; however, the airplane continued to settle, and the right wing touched the ground. He moved the engine throttle control to idle and maintained directional control with the rudder. A post-accident examination of the airplane, conducted by the responding FAA inspector, revealed substantial damage to the right wing spar. The right main landing gear had separated and was located on the runway, about 200 ft from the arrival threshold. Further examination revealed that the attachment hardware for the right main landing gear was not present in 7 of the 8 mounting holes on the top or bottom mounting brackets. One screw remained in the outboard top bracket of the assembly and was sheered consistent with overload. Several of the holes were elongated consistent with inadequate torque of the fasteners. In addition, fretting was noted at the gear/spar attach point. The sheet metal and mounting surfaces on the wing were otherwise unremarkable. A review of the maintenance records for the airplane revealed that the right main landing gear cylinder was removed and replaced on December 31, 2013. Several annual inspections had taken place since the replacement of the cylinder. The maintenance records indicated that the work was done in accordance with the Piper Maintenance Manual. According to the Piper service manual for the airplane, the upper bracket of the assembly required 4 screws to attach the bracket to the wing. The lower bracket of the assembly requires 4 bolt/nut combinations to attach the bracket to the wing. Each fastener should have been torqued to 50 to 70 inch-pounds at installation.